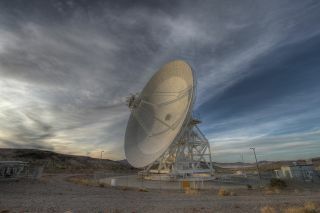 Engineers will use the Goldstone Deep Space Communications Complex in California to send new commands to the Opportunity rover on Mars in hopes of forcing the robot to make contact with Earth. NASA has developed a new, more powerful collection of commands to try to force the long-silent Opportunity rover on Mars to resume operations. Engineers haven't heard from the beleaguered robot since June 10, 2018, shortly before a global dust storm developed on Mars. The Opportunity rover, which is solar-powered, has ignored hundreds of calls from Earth since it first fell silent, which made team members worry that its mission has come to an end. That hope led the team to focus on so-called "sweep-and-beep" commands designed to nudge the rover to send a signal home when it powered up again, even if its internal clock was still off-kilter because of the storm. The new commands are designed to tackle that possibility and two others: the failures of its primary or of both its X-band radios. (In the statement, NASA called these scenarios unlikely.) With this new approach, Opportunity will be told not just to beep but also to switch communication modes entirely. NASA's announcement of the new approach comes just one day after the agency celebrated the 15th anniversary of Opportunity's landing, on Jan. 24, 2004. When the rover and its twin, Spirit, landed, they were designed to last 90 Martian days, each of which is about 40 minutes longer than a terrestrial day. Mission staff had hoped to hear from the rover by now, given the recent favorable weather patterns on Mars. Instead, Opportunity is now facing the onslaught of the frigid Martian winter, which could damage the rover further if it doesn't have enough power to keep itself warm. The agency said it will send the new commands to Opportunity for "several weeks"; if the rover remains silent, NASA will then need to decide whether to give up all hope for the mission.